By Nels Dzyre in Mobile. Updated on November 19, 2017 . Meetings may not always be productive but they are essential evils that keep the gears in the office oiled and running smoothly. If you need help creating a more organized, effective and efficient meeting or presentation, then this post will be of some help. We have for you today 5 great Android apps that can help with collaboration, keeping everyone on the same page, sharing files and important documents as well as web conferencing. Best of all, these apps are not only available for Android, some of them can be used across multiple platforms, desktop and mobile, so you don’t have to worry about who is carrying which type of mobile device. Mindomo is an app that is loaded with tools to help increase efficiency for brainstorming ideas. 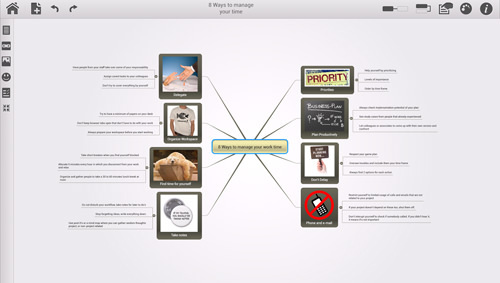 Users can easily draw out ideas on mind maps and turn them into a presentation. Colleagues can watch and even collaborate in real time. You can even embed Youtube videos, upload videos or sound clips, comments or use themes to improve the overall visualization of your mind map. The great thing about Mindomo is that it runs actively on all platforms such as Windows, Mac, iOS, Linux and of course Android. This is a great app to keep note of all your ideas since it can work both on desktop and mobile. Studiopass is a collaboration app to synergize your meeting content in one streamlined interface so that you can get all your files shared easily within the group in a meeting. You can present your Microsoft Office documents, PDFs and even videos to the participants and even let them collaborate on the documents at the same time. It also includes Dropbox support so you can import all your files easily and decide who can access your files by giving them roles ranging from administrator, folder manager, files manager or user viewer. They have support for Windows, Mac, iOS and Android platform but at the moment run only fairly well on tablets. This is one of the most popular services for setting up online meetings. 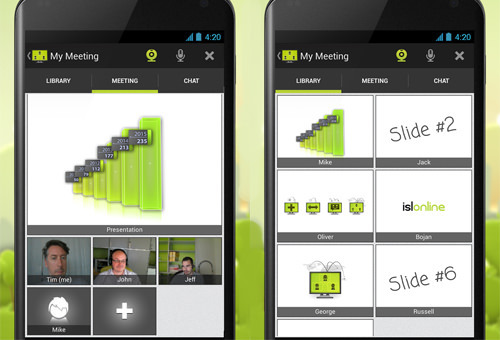 Cisco WebEx Meetings lets you schedule a meeting from your Android device while on the go. Its integrated VOIP and web conferencing via WiFi or 3G plus features like sharing content with annotations make it the perfect tool for team presentations. If you are the chairperson of the meeting, you can choose to pass the ball to other participants to make them the temporary presenter to contribute their section or their data in an quick and easy manner. Interested in experiencing a full online meeting experience? 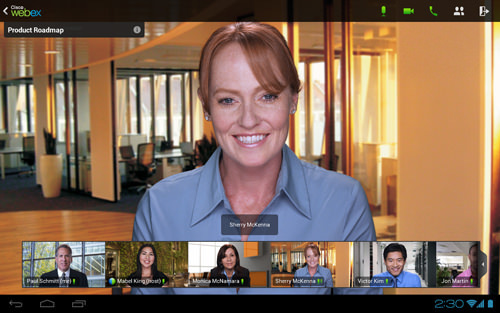 Try out Cisco WebEx Meetings. If you need a great online meeting app with great presentation features, you can check out ISL Groop. It also gives you the option to collaborate from just about anywhere. ISL Groop allows slide-sharing, drawing or even live screens. Meetings can be done on every major platform including Windows, Mac, Linux, iOS and Android, making them as competitive as many other similar apps on the market. If you are not always around for a meeting, you may give ISL Groop a try so you don’t ever miss another one again. Host your meeting in a streamline manner with this paperless boardroom solution Anywhere Pad, where you can schedule a meeting to brainstorm for ideas or do a presentation on the go all using your Android device. You can consult with your participants miles away while also sharing notes in real time. Anywhere Pad can help you to reduce the time you spend on scheduling meetings as well as archiving the meeting contents because you can send agenda, documents and updates easily. 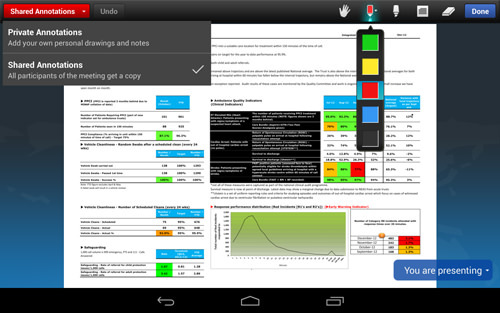 It also lets you download meeting-related documents for offline viewing. If you want to save paper and costs spent on document printouts then Anywhere Pad is the right solution for you.